"A growing number of bloggers around the world are emerging as “bridge bloggers:” people who are talking about their country or region to a global audience. Global Voices is your guide to the most interesting conversations, information, and ideas appearing around the world on various forms of participatory media such as blogs, podcasts, photo sharing sites, and videoblogs." "Our global team of regional blogger-editors is working to find, aggregate and track these conversations. Each day they link to 5-10 of the most interesting blog posts from their regions in the “daily roundups” section. A larger group of contributing bloggers is posting daily features in in the left-hand Weblog section, shedding light on what blogging communities in their countries have been talking about recently." has downloadable (and editable - it's a wiki afterall) guides for blogging anonymously around the world. Blog Safer: The Anoniblogging Wiki has downloadable (and editable - it's a wiki afterall) guides for blogging anonymously around the world. "The Lulu Blooker Prize is the world's first literary prize devoted to 'blooks': books based on blogs or websites." - it's got a number of articles and tips, including some good guidelines for teens and a section for parents. Parents whose children are into blogging should definitely check out BlogSafety - it's got a number of articles and tips, including some good guidelines for teens and a section for parents. Mac users can snag it here.
? We’ve just added the most popular buttons from our regular post editor without sacrificing the small size that makes BlogThis! so convenient. BlogThis! is great for writing a quick post about a page that you’re looking at, without the (comparative) hassle of opening Blogger.com in a new window, picking a blog to post on, copying over the URL to make a link, then copying over more text that you want to quote, accidentally kicking the power cord out of your computer when you get up to feed the cat, needing to call the plumber to pump out the flood in your attic, forgetting where you were on your computer when it starts up again, realizing that you can click Recover Post to get back the work that you had lost, discovering that the kitten ate all the big cat’s food and you have to feed them both again because the kitten’s on a special diet of castor oil and pencil shavings because it pukes normal kitten food all over the power outlets, which are now smoking because of the combined electrical draw of the attic pump, the computer, and the rock tumbler that you’ve tossed an effigy of the kitten in because that’s how you have to control your rage, when all you really wanted to do was make a little post to tell your friends about that new blog with pictures of cute kittens and other things on it, but now you think that you don’t even want friends any more if this is the kind of situation they’ll put you in. See? BlogThis! eliminates all of that. 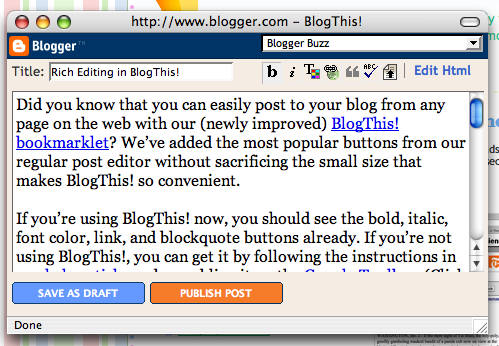 Did you know that you can easily post to your blog from any page on the web with our (newly improved) BlogThis! bookmarklet? We’ve just added the most popular buttons from our regular post editor without sacrificing the small size that makes BlogThis! so convenient.